Want a fresh take on the classic strawberry Jello cake recipe? 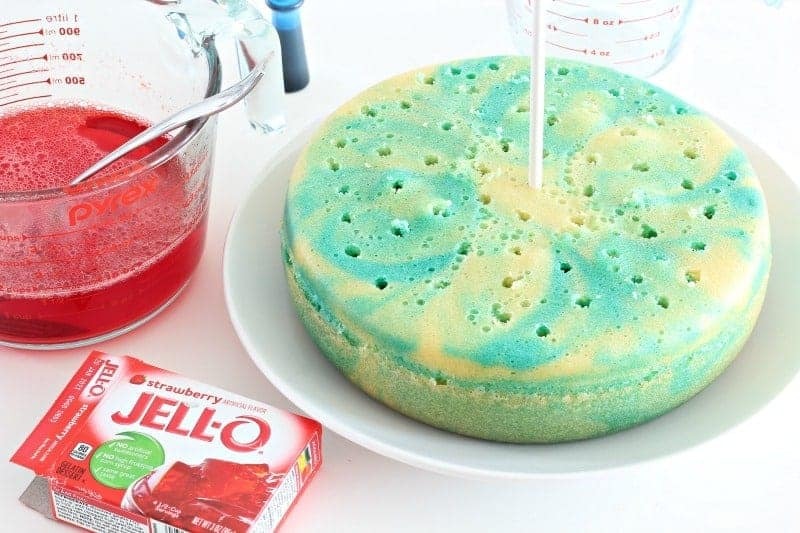 This colorful Jello poke cake is perfect for birthday parties, Valentine’s Day, and summer barbeques and picnics, with the same moist and delicious strawberry Jello poke cake flavor your tastebuds crave when warm weather rolls around! 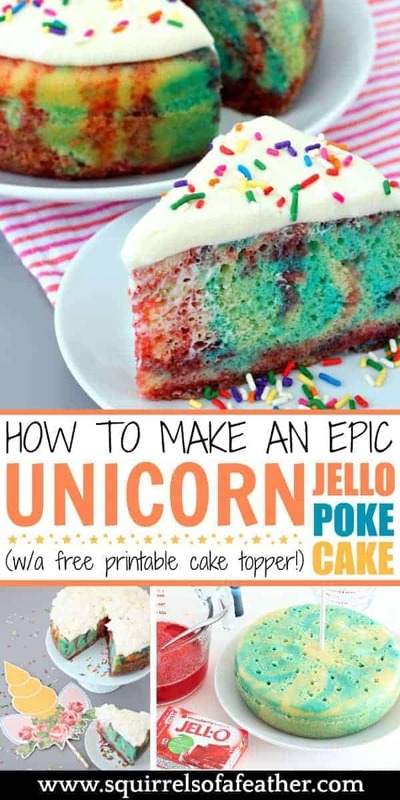 Read on to find out how to make this magical unicorn jello cake. 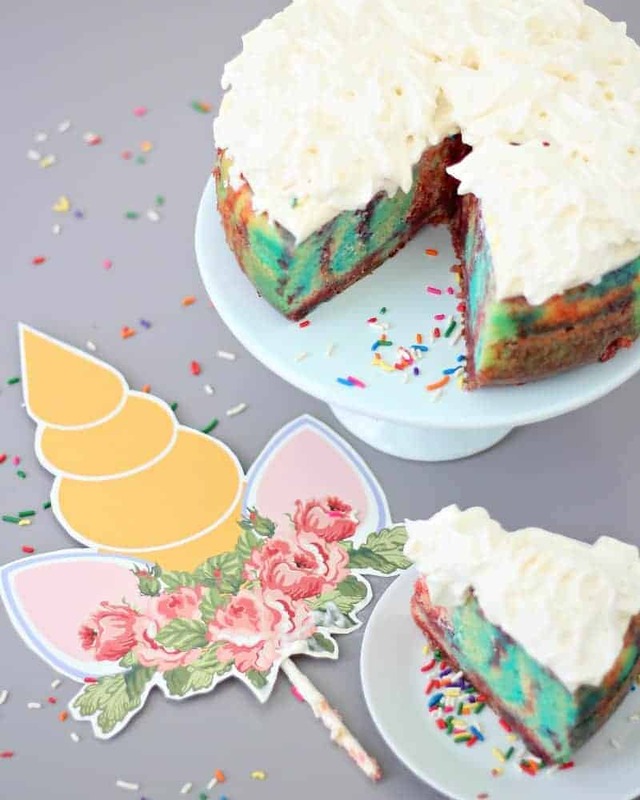 This unicorn Jello poke cake is really a simple strawberry Jello cake — I just used a few top-secret baking tricks to turn it into the colorful unicorn cake you see before you! 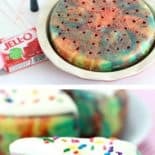 That’s right, this easy strawberry cake recipe uses jello and cake mix to create the perfect poke cake, swirling with colors. Top it off with whipped cream or Cool Whip and you have the perfect summer dessert! But this cake isn’t just any old cake — it’s a declaration. I made this cake for my son — and also for the little girl who told him that boys can’t like unicorns. Here’s the backstory behind this cake. One day Big Brother (5), Little Brother (3), and I were at the playground when two moms with three little girls in tow showed up. The mothers sat down to chat on a bench and the little girls ran over to the swings. Big Brother (having nary a shy bone in his body) ran right up to the girls, who were involed in a lively discussion about unicorns. At this point, I decided to nicely to point out that boys liking unicorns should be no different than girls liking Spider-man or Batman. They all shrugged their shoulders and ran off to play together, but that conversation stayed with me. So this magical unicorn cake is for my son, in the hopes that he and his brother never lose their sense of wonder and awe — and will be strong enough to withstand pressure from antiquated beliefs regarding what boys can and cannot like and do. 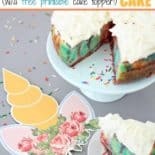 Stick around at the end of the recipe to get your free unicorn cake topper printable! You can use any boxed cake mix for your unicorn jello cake; I chose Duncan Hines French Vanilla flavor because I like that better than plain white. 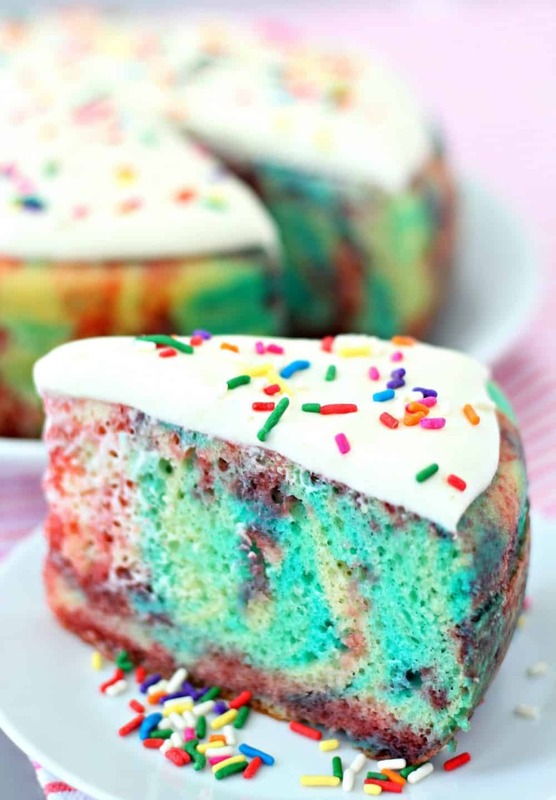 You just want to make sure you choose a cake mix that is light in color so that the unicorn colors really pop! We will be using pink, purple, and blue to color this cake unicorn-style. You will also need the ingredients that go along with the boxed cake mix (for me, that was water, vegetable oil, and three eggs). I don’t like having tons of kitchen appliances and bowls so I pretty much use this one ginormous stainless bowl for everything (you can also see it in action in my giant rice cooker pancake recipe). In fact, I actually used my rice cooker to bake this cake, but you can use a round cake pan and get the same results! You can either choose to use a round cake pan or a 9 x13. The wooden spoon/chopstick/cake pop sticks will be used for poking holes in the cake — I used cake pop sticks, which incidentally also works well for the unicorn horn cake topper printable. If you are using a round cake pan and you want the sides to be visible like mine are in the pictures, remove and place on the plate you want to use before you pour the jello; after pouring and setting the jello, the cake is very moist and hard to move without it falling apart! 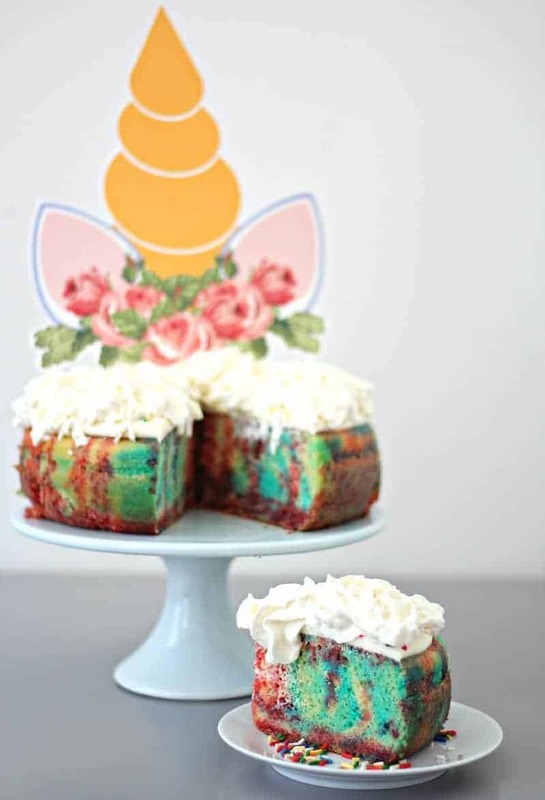 If you prefer the standard strawberry poke cake rather than unicorn cake, simply cut the steps for coloring the batter blue and making purple jello! Just make the cake, poke, add red jello, refrigeraterate! Taking the bowl with 1/3 of the batter, add in blue food coloring and mix until you get it as blue as you want it. 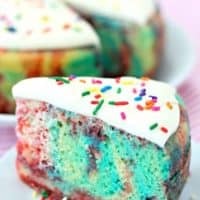 Add the cake batter into a greased cake pan (or in my case, rice cooker with the bottom sprayed with cooking spray), alternating spoonfuls of white and blue batter until all of the batter is placed in the pan. Cook according to the boxes instructions until cake is done. Remove and set aside to cool for 1 hour. While the cake is cooling, heat water to boiling for the Jello. Prepare the strawberry Jello with 1 cup of boiling water and mix for two minutes until gelatin is dissolved, then add 1/2 cup cold water and mix again. 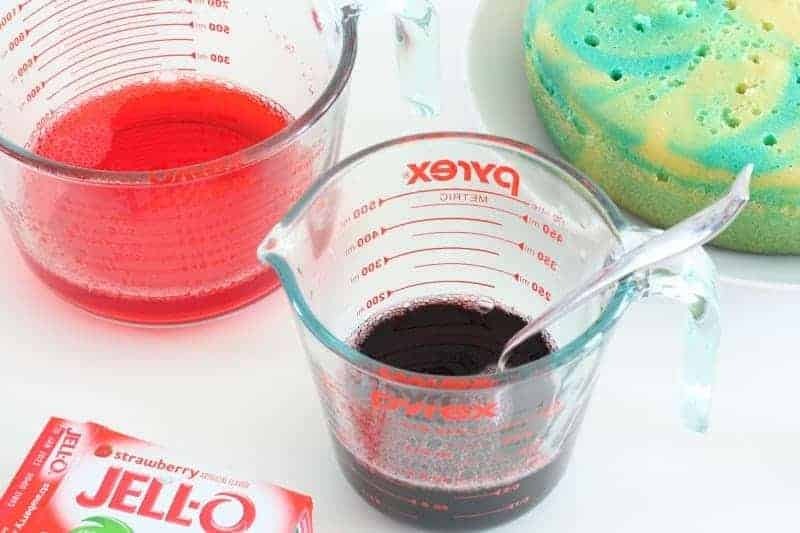 Remove 3/4 cup of the liquid jello and place in another measuring cup. Add one drop of BLUE food coloring to one of the bowls and stir — this will be your purple Jello. Add another drop of blue if the purple is not deep enough. Taking your chosen poker tool, poke a hole in the very center and then continue to poke holes, radiating out in lines from the center. Poke more holes, keeping them about half an inch apart. 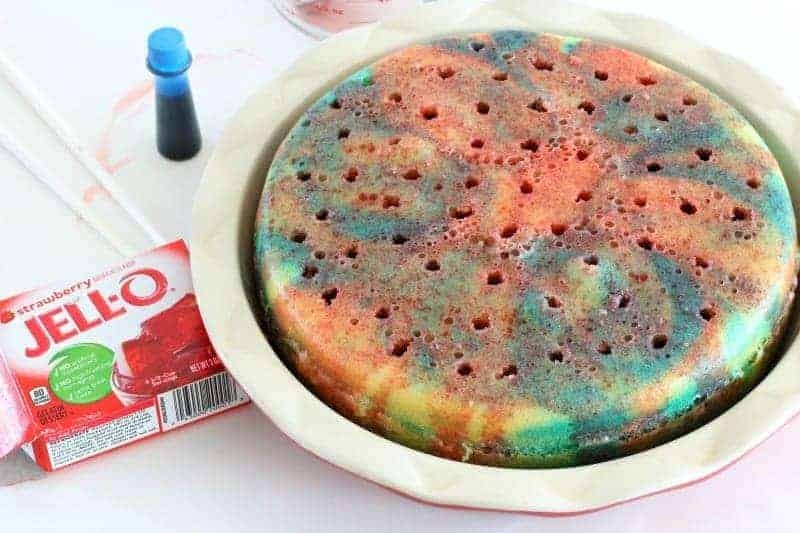 After poking your holes, take the liquid jello (pink and purple) and alternatingly pour them over the poke cake and into the holes as well. Continue until all the jello has been poured over the poke cake. Cover and place in the fridge for 3-4 hours or longer until ready to serve, topped with whipped cream! Vegan? Enjoy These Edible Marbled Christmas Ornaments! Just sign up in the newsletter subscription box below and once you get the confirmation email with the password, go to my resource library to print your freebies at any time! Once you have the cake batter, separate the batter into 2 separate bowls. Place 1/3 of the batter in one bowl and 2/3 of batter in the second bowl. 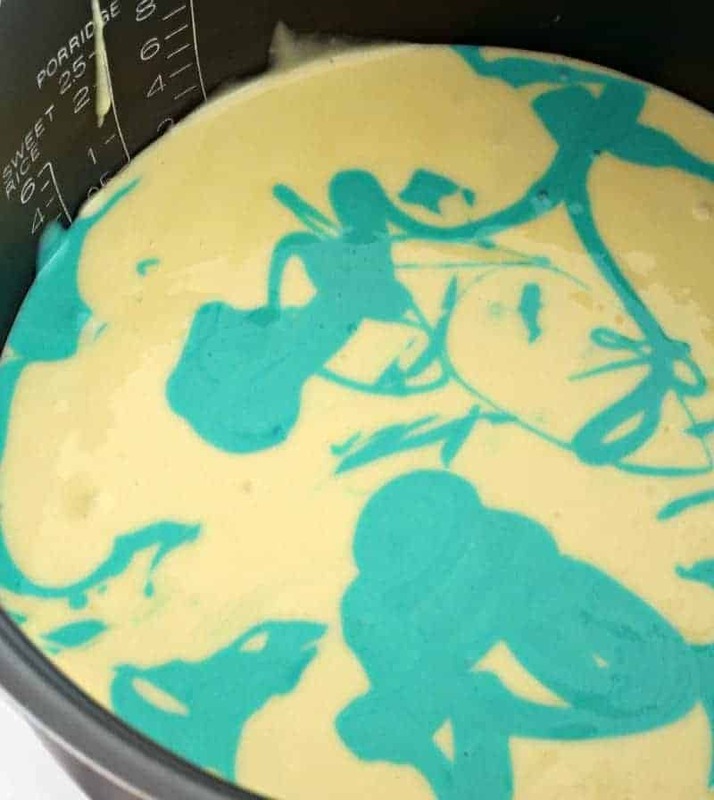 Taking the bowl with 1/3 of the batter, add in blue food coloring and mix until it turns blue. 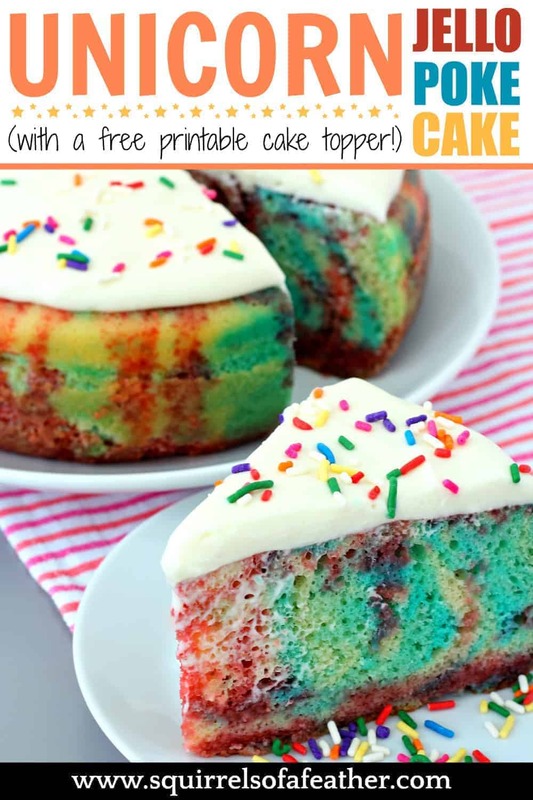 Add the cake batter into a greased cake pan, alternating spoonfuls of white and blue batter. Cook according to the boxes instructions until cake is done. Set aside to cool for 1 hour. Prepare the strawberry Jello with 1 cup of boiling water and 1/2 cup cold water and mix for two minutes until gelatin is dissolved. Divide liquid Jello in half (two 3/4 cup bowls) and add ONE DROP of BLUE food coloring to one of the bowls and stir — this will be your purple Jello. Add another drop of blue for a deeper purple. Poke holes in the cake, around 1/2 inch apart all over the entire cake. Take the red and purple jello and alternatingly pour them over the poke cake and into the holes as well. Continue until all the jello has been poured over the poke cake. Refrigerate for 4 hours then serve with whipped cream or Cool Whip on the top! Add a cake topper if desired.